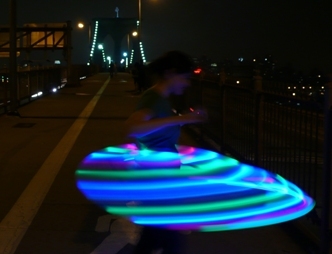 My second LED Hoop Workshop went pretty well on July 19, 2008. Thanks to everyone coming out in the hot summer afternoon. We had 10 people this time so it was very busy and I am sorry if I could not give everyone the right amount of attention, but I think we had a 95% completion rate? Three of you opted to try the rechargeable upgrade so it did add more complexity and time. Some of the wire stripping tools also malfunctioned but I have tested all of them and have thrown own the culprits. We also learned a thing or two about silencing the hoop that I can pass onto the next class. Special thanks to Gustav for helping me out showing others how to finish their hoops. And he also prepared his hoop for some extra modding. Can’t wait to see what it looks like when you attach sensors to it. I have already heard some very positive feedback from you troopers. If you have any comments to add please do so below so that future workshop goers can get an idea of what it’s like. Most of you tell me you are very satisfied at the end of class to see your hoop working that you made yourself. And you also know it inside and out allowing you to modify or fix it at anytime. My next class is scheduled for this Saturday July 26. I am going to try to keep is small and limit the number to about 5 or 7 so sign up quick! Go to 3rd Ward for the sign up and material fee. I have been hearing good things about this workshop and have been dying for a LED hoop. I can’t make it to this weekend’s class due to double shift this saturday. But I hope you have another one soon. I look forward to finally making something of my own for once. What a wonderful workshop. I now understand what goes into making a quality glow hoop and feel confident enough to fix any of mine if they should ever break! 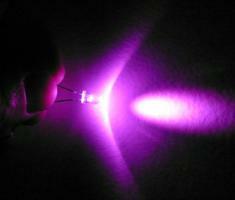 It has also given me all these great ideas for future LED toys/tools! Are there anymore classes coming up?